Joel's Jottings: The Great Hindu Monk's 150th Birth Anniversary. The Great Hindu Monk's 150th Birth Anniversary. Today is the 150th birth anniversary of Swami Vivekananda who, without a doubt, can be called the greatest missionary of Hinduism. I remember exactly this day, 25 years ago, I stood at Belur Muth, Kolkata, India, in front of 7000 people - with butterflies in my stomach - speaking about the youth perspective on National Integration from his teachings. I was 20. And I was proud. So, were my parents, and my college's principal, because I was selected from among all the colleges of Hyderabad to represent Ramakrishna Mutt, Hyderabad at theYouth Session of the 125th Birth Anniversary Celebrations of this great Hindu teacher. What I learnt about Swami Vivekananda during my preparation for the talk, and especially during my six-day stay at Belur Muth, Calcutta (as Kolkata was called then) was truly, and amazingly, eye-opening and mind-opening. So, I am dedicating this post to the monks I met during that time. As a Christian who grew up questioning my religious belief, and as a young boy who was seeking knowledge on how religion matters, I was truly blessed by my association with Ramakrishna Muth, Hyderabad. I really do not know how much the current leadership of this mission is doing in promoting discourses and debates on religious values and their application to everyday living, but it had had a profound impact on my personal value system, during my formative years. Today, even though I am now a Christian by personal choice and conviction, my respect for this amazing and zealous teacher has only grown with age, and I am sure, it will never diminish. I just wish India produced more such philosophers and teachers. I had a couple of rare opportunities to actually talk with Swami Ranganadhanandha and Swami Prabhupadananda, who were at the Hyderabad Center of the Ramakrishna Mission - a mission founded by Swami Vivekananda in 1897, and which bases its work on the principles of karma yoga. It subscribes to the ancient Hindu philosophy of Vedanta.. The Mission's headquarters at Belur Math in Howrah, near Kolkata, India, was a great place for me to spend six days understanding the Hindu belief system. I must have talked and questioned very immaturely then, but I will not forget my discussions with Swami Krishnamachari, who patiently explained 'Vedic Hinduism' and even surprised me with his interpretation of what Jesus could have meant when he told the Samaritan woman He meets at the well, about 'living waters'. I came to understand that these Hindu monks of the mission take-up celibacy - only to devote more time to studying Hindu scriptures and comparative religion. And they go through years of education, like any Christian pastor or priest would do, at a seminary. Like the other seven speakers at the youth session selected from across the country, I received eight huge volumes of 'The Complete Works of Swami Vivekananda' which I will always cherish. I will never forget the amazing way in which Swami Vivekananda talks about Jesus' teachings in the 4th Volume, which I have brought to Bahrain, and I keep referring. 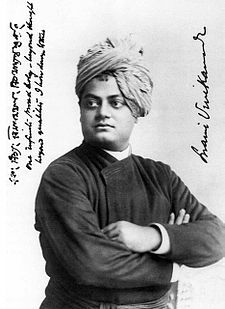 Recently, less than six months ago, when on a sight-seeing trip with family and friends, I had the pleasure of renewed memories when I stood on Vivekananda Rock Memorial, and explained to my two daughters, the greatness of this man who stunned the world with his Chicago Address. He died when he was just 39. But by then, he had traveled the world, when airplane travel was unheard of, and had influenced the generation of that time, and this one. On the 150th anniversary of his birth, I salute the great teacher. Joel garu, as Keats said, " education is not for sweetening our mouth ,but make others inspired about life". tell me now, how many of us are doing this. Vivekananda was selected to give speech in Chicago as you were selected to speak at Belur. I was also in belur math as well as in Chicago. i was equally impressed with American hero Lincoln and i felt thrilled when i visited Lincoln memorial. these are great people who influenced and changed thinking of others to noble ways. when I saw you , I knew you had spark. but I know who lit it . nowadays, youngsters do not have proper Idols and no wonder they lack direction. pl. continue to inspire Bharain youth as your idol inspired Indian youth.